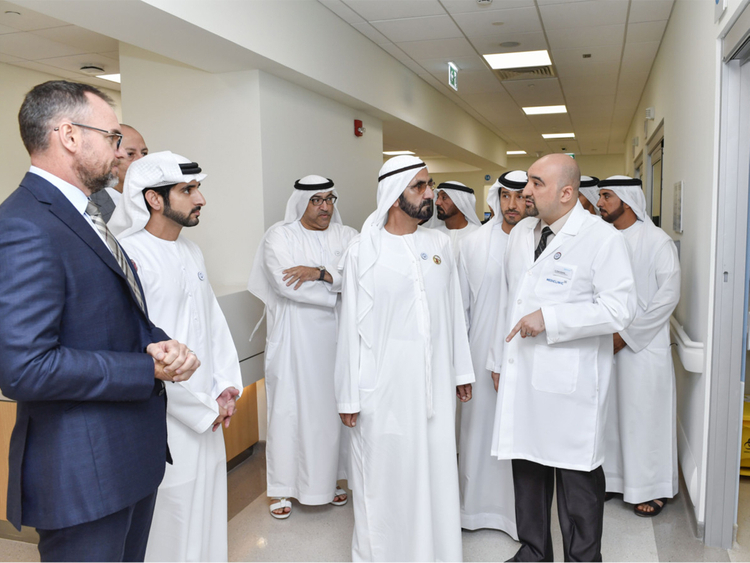 Dubai: His Highness Shaikh Mohammad Bin Rashid Al Maktoum, Vice-President and Prime Minister of the UAE and Ruler of Dubai, on Monday visited the Dh685 million Mediclinic Parkview Hospital in Al Barsha. He toured the seven-storeyed state-of-the-art medical facility offering multi-speciality outpatient services, and has the capacity of 182 beds. On the first leg of his tour, Shaikh Mohammad inspected the emergency department, fully furnished with the latest medical equipment and supplied with highly qualified human resources trained to deal with emergencies 24 hours. Accompanied by Shaikh Hamdan Bin Mohammad Bin Rashid Al Maktoum, Crown Prince of Dubai, Shaikh Mohammad visited the radiology department where he viewed the latest computed tomography (CT Scan) equipment. He also visited the intensive care ward for newborns, which is equipped with hi-tech medical equipment. Shaikh Mohammad wrapped up his tour by visiting the royal VIP ward which consists of a luxury room for patient’s escorts and a patient’s room equipped with a special bed and medical equipment and physical therapy seat, in addition to a dining room and a room for guests and visitors, among other facilities. Shaikh Mohammad congratulated Mediclini International Group, which was established in South Africa in 1983, on the momentous achievement. He welcomed innovative thoughts by international investors wishing to invest in the UAE’s health care services, or educational, cultural and tourism sectors. Shaikh Ahmad Bin Saeed Al Maktoum, President of Dubai Civil Aviation, Chairman and Chief Executive of Emirates airline and Group, Abdul Rahman Al Owais, Minister of Health and Prevention, and senior officials, were present.